Dr Greg Slabaugh and Dr Constantino Carlos Reyes-Aldasoro will be co-chairing the 18th annual Medical Image Understanding and Analysis conference from 9th to 11th July. 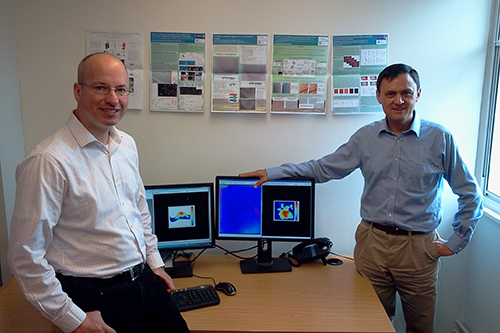 Two of City University London's academics specialising in medical imaging will be co-chairing the 18th annual Medical Image Understanding and Analysis 2014 conference, held from 9th to 11th July at Royal Holloway, University of London. Dr Greg Slabaugh, Senior Lecturer in Computer Science and Dr Constantino Carlos Reyes-Aldasoro, Lecturer in Biomedical Image Analysis in the Department of Electrical Engineering, will be raising City's profile in the field of Medical and Biomedical Image Analysis - an interdisciplinary activity which draws on expertise found in computer science, engineering, physics, clinical practice and bioscience. "Dislocation or fracture of the cervical vertebrae has the potential for long-term and life-changing disabilities. In this project, we are developing image analysis tools to aid in human interpretation of the images, with the intent of reducing incorrect or delayed diagnoses. The project currently involves nine researchers; five at City, as well clinical partners at the University of Exeter and the Royal Devon and Exeter Hospital, and a commercial partner, Optasia Medical." At MIUA 2014, Dr Slabaugh will co-author the first paper that applies computer analysis techniques for mucosal (moist) tissue imaged with photometric stereo. He explains that "Photometric stereo is a computer vision technique that uses a single camera and multiple light sources to reconstruct, in real-time, a 3D representation of objects in the camera's field of view. This technology, when miniaturised, has the potential for in-vivo 3D analysis of the gastrointestinal tract -- imagine a Microsoft Kinect imaging inside the body -- with applications to colon cancer prevention and surgical treatment. 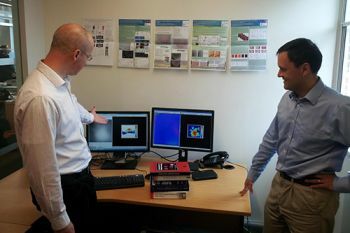 This project is a joint work with the University of the West of England and St. George's Hospital." "In my cancer studies, I have worked on the development of substances aimed at destroying the vessels that surround tumours to prevent them from getting nutrients and at the same time remove the escape route of cancer cells to other parts of the body. In my studies of inflammation I examine the fascinating kinetics of some specialised white blood cells which travel to sites of injury and inflammation and help the healing processes of our bodies. Since it is very difficult to observe these cells in humans, we observe them inside a little fish called a "zebrafish" which among other advantages is transparent so that cells can be seen as they travel through its body. I have active working collaborations with academics in the United Kingdom, Portugal, Spain, Germany and Australia." Dr Reyes-Aldasoro has enjoyed the "friendly and stimulating environment" of MIUA conferences for over a decade, as a PhD student, research assistant, a member of the steering committee and now as a co-chair. "Carlos and I are excited to be co-chairs of this year's MIUA conference. We've arranged a fantastic programme, including keynotes from eminent scholars (including Professor Dave Hawkes of University College London; Professor Jean-Christophe Olivo-Marin, Institut Pasteur; Professor Roger Gunn, Imperial College London), oral and poster sessions where authors will present original work, and two tutorials - Matlab for Medical Image Processing (Dr. Jasmina Lazic, Mathworks) and Decision Forests in Medical Image Analysis (Dr. Antonio Criminisi, Microsoft Research Cambridge). This year we will also have delegates from several countries in Europe and as far away as United States, South Africa, Indonesia, South Korea and Taiwan."